In Today's world people are living longer and more importantly are remaining active well into their senior years. While there are not too many Grandmothers riding motorcycles, I am so amazed at how vibrant, active and full of life my own mother is at the age of 76+. She is more on top of her finances and home environment than most other people of any age. Fortunately she planned for these years and is now reaping the benefits. Since my mother is also an attorney, I draw upon her direct experience in matters of Elder Law. 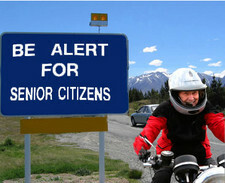 It is imperative that you plan for your later years in life. Elder Law is a relatively new and specialized field of law that deals with the issues often faced by the fastest growing segment of the US population - the elderly. Elder Law combines elements of Estate Planning, Wills and Trusts, Guardianship, Health Care Planning and Medicare/Medicaid Planning. It encompasses many of the topics discussed throughout this website such as: Living wills, Last will, guardianship, and reverse mortgage. Some aspects of elder law involve more detailed Medicare and Medicaid planning. All of which is designed to protect the elderly and their assets. To set up a consultation concerning any elder law matter, contact us online or call us at (201) 656-1000.